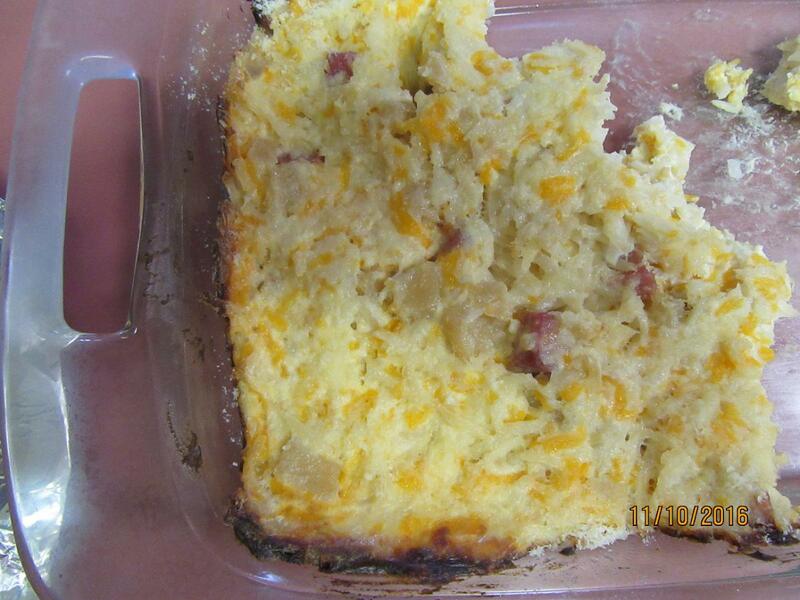 “I mostly use this as a breakfast casserole, but it’s great anytime. May be served with or without diced ham. Quick and easy to make, not to mention delicious! Bake 1 hour in preheated oven, or until bubbly and lightly brown. Serve immediately. zucchini and onion; cook, stirring often, for 5 minutes or until zucchini is softened. 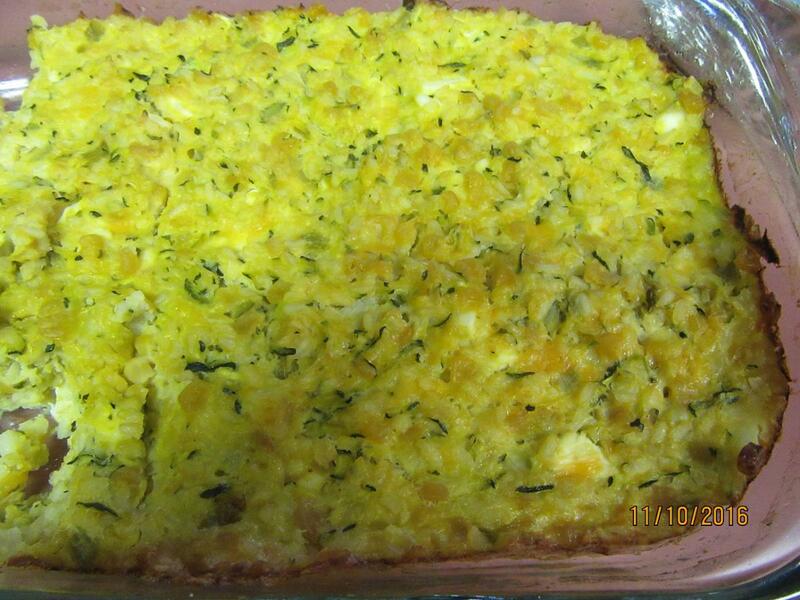 In a large bowl, beat eggs and egg whites with a fork; stir in cooked rice, corn, chilies, cheeses and zucchini mixture. Mix well. Pour into 9x13 inch baking dish coated with cooking spray. Bake 45 to 50 minutes or until knife inserted in center comes out clean. Love it or hate it, the tuna noodle casserole is an American classic. This dish and the renowned green bean casserole are the two most asked about casseroles that are not currently on our menu. Why, you ask? We deliver our products frozen, and neither of these dishes freezes well. They’re best when enjoyed fresh from the oven. With that said--and after the umpteenth request for this old-school favorite—we pay our respects here. Melt 1 tbsp of butter in a large nonstick skillet set over medium-high heat. Add the bread crumbs and toast until just golden brown, 3 to 5 minutes. Transfer the crumbs to a small bowl and set aside. Melt the remaining 1 tbsp of butter in a medium sauté pan set over medium-high heat. Add the mushrooms, onion, paprika, cayenne, and ½ tspn salt and cook, stirring often, until the mushrooms and onion are golden brown, about 8 minutes. Stir in the broth and cream, and then add the noodles. Increase the heat to high and cook at a vigorous simmer, stirring often, until the noodles are nearly tender and the sauce is slightly thickened, about 8 minutes. Remove the pan from the heat and stir in the tuna, peas, Parmesan, and parsley, and season to taste with salt and pepper. Pour the mixture into a 9x13-inch casserole dish and sprinkle the bread crumbs over the top. Bake until the edges are bubbly, about 8 minutes. Any excuse to eat cornbread at dinner is a good one in my book. This delicious and spicy cornbread-topped casserole is a complete meal with grains, beans, and vegetables all in one dish. Serve with hot sauce, such as Tabasco, on the table. Chef’s Note: Any bell pepper will work here, but green bell peppers are more authentic. Preheat oven to 400 degrees F. Grease an 8 or 9-inch square baking pan or casserole dish. Drain tomato juices into a skillet and chop tomatoes into smaller pieces; set aside.Add water as necessary until a thin layer of liquid covers the skillet. Saute onion, celery, garlic, and bell pepper over high heat until onion is translucent, bell pepper slices are tender, and all of the water has evaporated, about 4 minutes. Turn off heat and mix in 1 to 2 tbsp of Cajun Seasoning, tomatoes, and kidney beans, stirring to combine, and set aside. In a small mixing bowl, whisk cornmeal, baking powder, salt, and additional Cajun Seasoning if desired (several dashes so the cornmeal looks speckled when stirred). You can also add 1 to 2 tablespoons of sugar for a sweet cornbread topping. Then stir in nondairy milk and applesauce. It should be thick, but spreadable like hummus, not dry. Pour bean mixture into your baking dish and pat down firmly with a spatula. Spread cornbread mixture on top and bake for 30 to 35 minutes, or until the cornbread is a deep golden, cracked and firm to the touch. Let set out for 15 minutes before serving.